What did the Kinsella family had as a dietary supplement while growing up? Joan of Arc, American Football, Owen and now this, Birthmark, the solo project of Nate Kinsella. All wonderful bands, tackling different genres, all doing a great job. 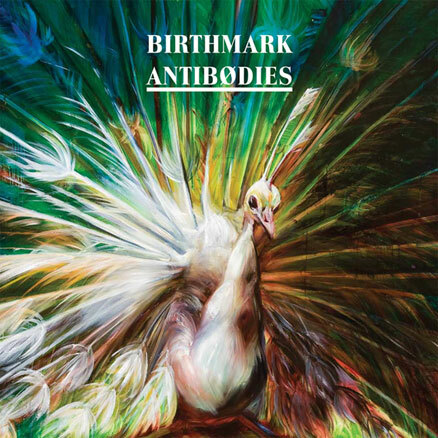 Antibodies finds Birthmark alone in an instrument shop, with little musical boxes, drum machines, guitars and basses set up in a Rube Goldberg fashion, creating this amalgam of sounds that create lovely, playful atmospheres throughout the 9 sweet songs that Nate Kinsella lays out carefully, like a clock master disassembling a fob watch and put it back together right. ‘Stuck’ starts in a quirky manner, like the breezy soundtrack of a coming of age film (Gordon Joseph-Levitt starring, of course), keeping that marimba rhythm sparsely over a looped beat. The almost shushed vocals add an air of being slightly too shy, but not overtly so (hey, he mustered the courage to sing, right?). Not a coincidence that the looped beats break for a few moments after the declaration of “I’m stuck in here” is made. Perfect start. Samples. There’s a lot of looped sounds, coming together like clockwork. ‘Shake hands’ has this lil’ bass sound that reminds me of the sounds the little sumo wrestler from the old Bruce Lee game (commodore 64!) used to make. The cyclical beats are accentuated by strings, enriching the atmosphere laid out. The music is no longer an old cotton blanket, it’s a brocade image by your bookcase. ‘Keep ’em out’ is the bottle of port you hid behind the Bible, by the way. ‘Please go away’. A plea or an order. It’s hard to tell apart, as the vocal treatment makes it slightly confusing. It could be good ol’ pent-up anger or just a frightful whimper. The atmosphere is rich, the choice of instruments seems to be endless. It’s all about juxtaposition, it seems, as the unsettling ‘Please go away’ is followed by a superbly intimate track, ‘You lighten me up’. There is no confusion here, all energies have been spent, just a droning set of strings and a haunting piano being upstaged by Kinsella‘s honest voice. If you need another dose of this gorgeous minimalistic approach, album closer ‘Big man’ is your Huckleberry. A cornucopia of musical ideas are presented by the myriad of instruments being layered like Hanoi Towers by Birthmark. The nine songs that make up Antibodies are the clashing emotions that swirl in our hearts and battle the cold logic our brain dictates. In the war between emotion and logic, who wins? We might never find out (or accept) the outcome, but if there was a good album to serve as a soundtrack, this is it. Birthmark Twitter. Facebook. Bandcamp. Myspace. Posted in Dreamy, Introspection, reviewsTagged Angular, Antibodies, Birthmark, dreamy, Polyvinyl RecordsBookmark the permalink.